With the countless distractions that come from every corner of a modern life, it's amazing that were ever able to accomplish anything. 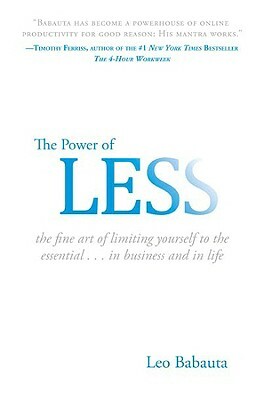 The Power of Less demonstrates how to streamline your life by identifying the essential and eliminating the unnecessary freeing you from everyday clutter and allowing you to focus on accomplishing the goals that can change your life for the better. Leo Babauta has been a reporter, editor, speechwriter, and freelance writer for the last 17 years. He founded ZenHabits.net with no funding in January 2007, and one year later it is a top 50 blog with about a million unique visitors per month. Using the methods he shars in THE POWER OF LESS over the last two years, he's trained and successfully completed a marathon, he's doubled his income, he's eliminated his debt, he's quit smoking, and he's written a novel.